The next time we went out we had been talking about paddle length for surfing, flatwater, thick race boards vs slim surf boards. Noticing the freeboard on my Naish ONE, I thought I might add an inch to the length of my Tiare paddle before we headed out, just to compare. Oh, the joy of an adjustable paddle! 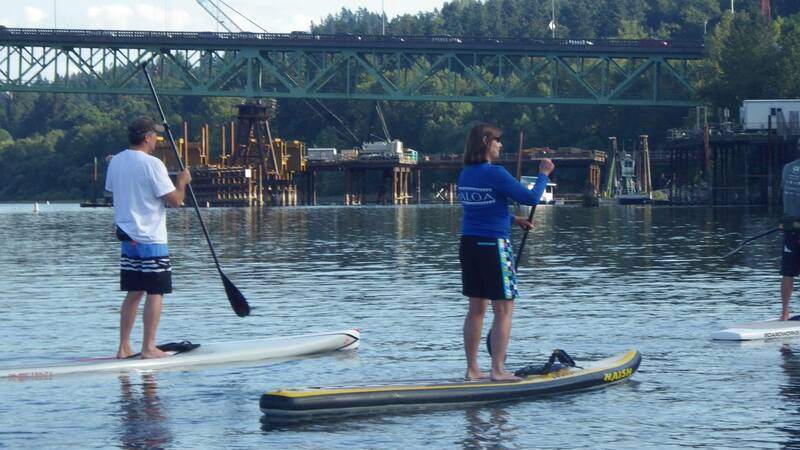 Yes, great to share with friends but so cool to learn something about my paddle stroke, paddle length and efficiency. 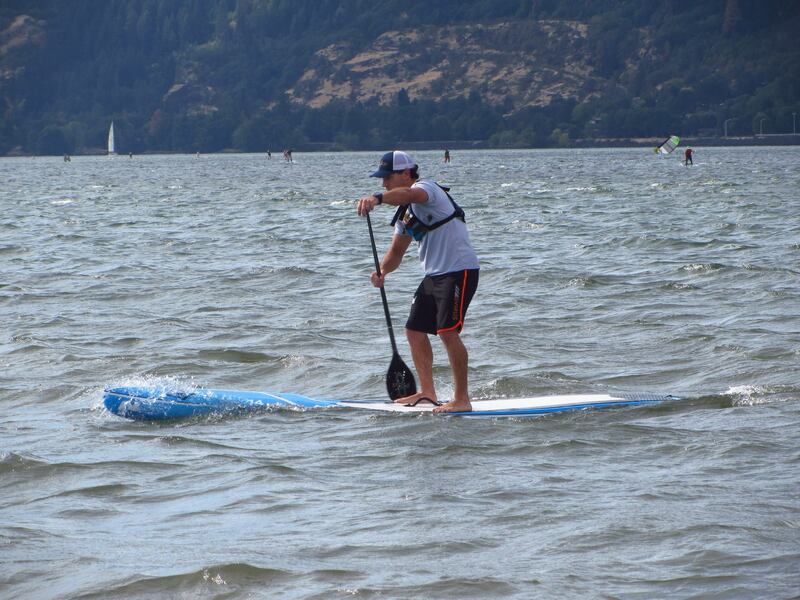 Waking up the day after the Naish Columbia Gorge Paddle Challenge 8-mile down wind event I had a very cool discovery. I was sore in different places than my usual. I had adjusted my technique a bit and I think I think the pecs, abs and lat soreness were better than the usual fatigue. We had spent an evening a few days before the event learning a lot at a clinic given by Travis Grant on the Willamette River at the Gorge Performance site. 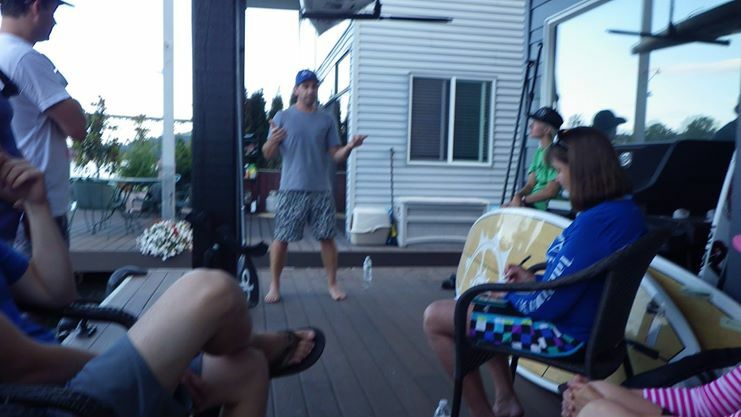 Travis began by explaining how much outrigger paddling prepared him for success at SUP. 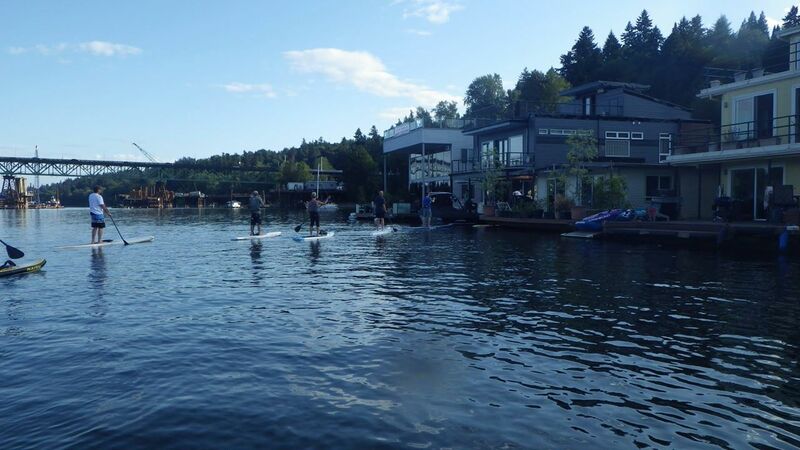 The goal in standup paddling, as in outrigger paddling, is to be as efficient as possible. The result will be your ability to go faster, further and longer. 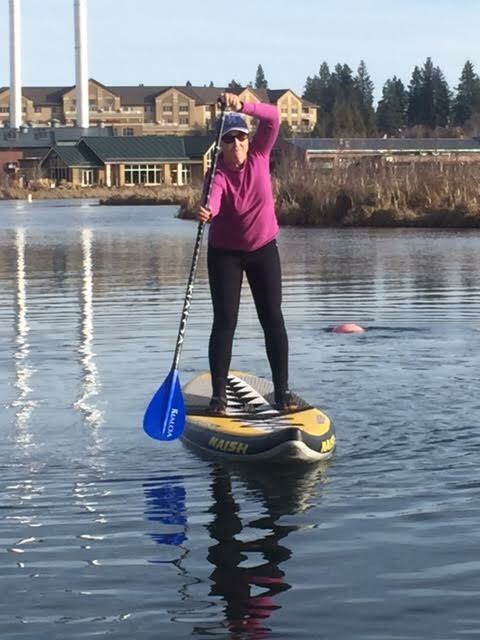 By listening to your body and honing better technique you will be better able to paddle without injury. 1. Stand with feet facing forward in a wide stance. This gives more power, more balance and more stability. 2. Maintain soft knees that are ready to deliver power. 3. 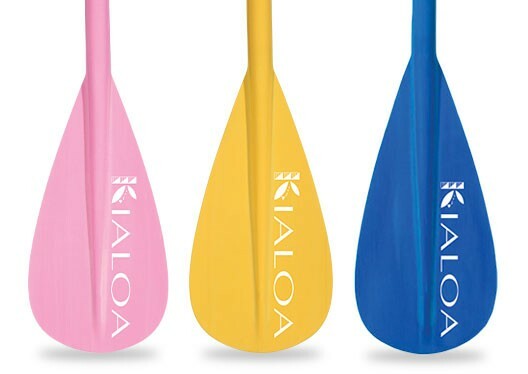 This was really valuable – “If you think of why you do what you do then technique changes make more sense.” For instance, think of planting your paddle blade fully into the water. Think of it as being stuck in sand. You want to move the board forward, not pull the paddle past the board. By imaging the blade stuck in sand it is easier to image the forward driving motion delivered by body rotation and a strong core. 4. Slow down to go faster – this means that if you must slow down to get your technique right, you will go faster in the long run. Part of this slow down is the opportunity to really engage your abs, your core, as you rotate your body with the paddle reach and catch. Keeping your core engaged through the return and you uncoil from that rotation allows you to derive your power from your larger muscles. Proper body mechanics will allow for your greatest reach and you most efficient stroke. 5. 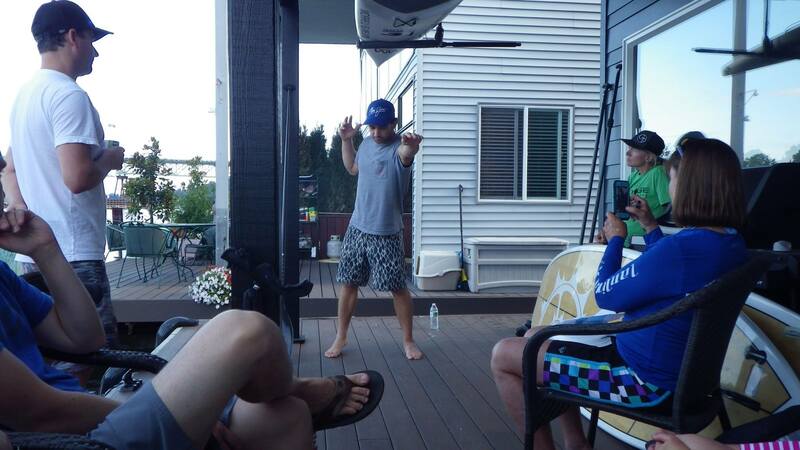 Above all, Travis seems to live a relaxed and playful approach to training, focus, excellence and teaching. So when I woke up with soreness in my pecs, abs and glutes it was a huge, “Wooohooo!” Not only did I have a great down wind experience with plenty of speed and glides, my perceived exertion was so much less. I played at honing technique throughout the race – and love the results of the coaching from Travis grant. If you can make it to one of his clinics – do it! A video is a good way to get to know Travis (see below) but one on one water time with Travis at a clinic is worlds better!